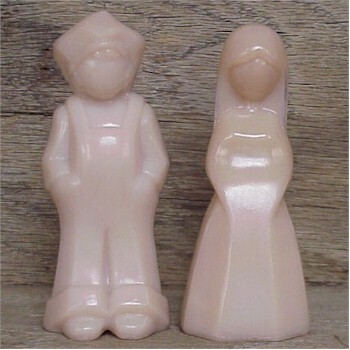 1981 Jenny & Josh Set in Heirloom Pink, Bargain Shack offers Boyd Glass, Mosser Glass, L.G. Wright, and Contemporary Collectible Glass including Vaseline Glass - J.B. Scottie Dogs, Pooche, Animal Covered Nests, Toothpick Holders, Salts, Glass Animal Figurines, Clowns, Dolls, Slippers, Vehicles, and More! This is the set of 1981 Jenny & Josh dolls in Heirloom Pink. Created for the month of February Heirloom Pink is an opaque Crown Tuscan pink. In excellent condition with no chips or cracks.